We’ve already seen Allwinner H5 processor in several development boards such as NanoPi NEO2, Orange Pi Zero Plus, or Libre Computer Tritium 2G among other. But while the processor has been designed for 4K OTT TV boxes, I had not seen any TV box based on the processor so far. 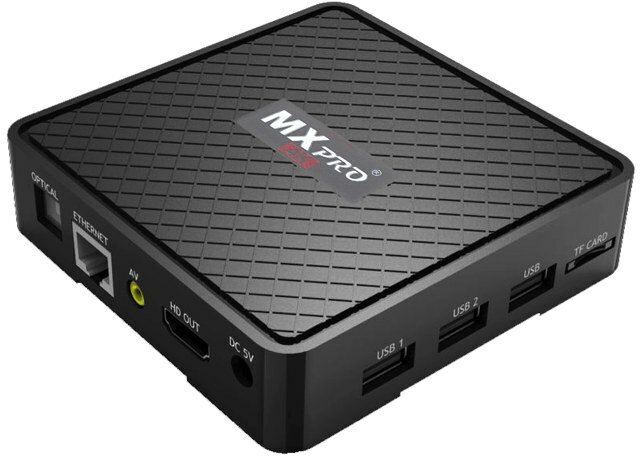 MX Pro 4K, not to be confused by MXQ Pro 4K, changes that, as it features the quad core Cortex A53 processor combined with 1GB RAM, 8GB storage, and the usual HDMI, Ethernet, USB ports you’d expect from a TV box. The box runs Android 7.0 OS, and ships with a user manual, an IR remote control, a HDMI cable, and a power adapter. The box is sold for $33 or more on sites like Aliexpress or eBay. 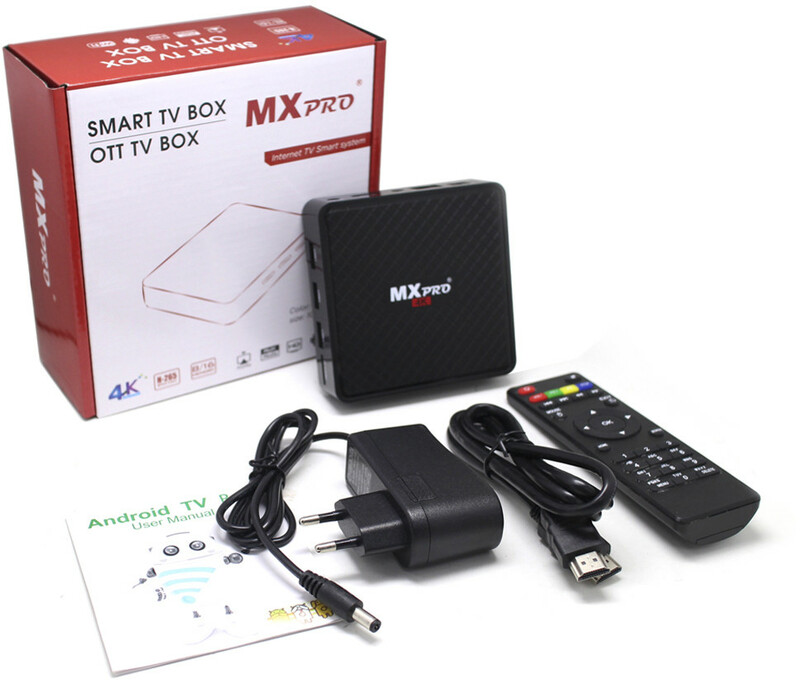 I’m not sure the TV box brings any advantage over Amlogic S905W boxes for example, but MX Pro 4K could be interesting if you want to leverage Linux support from H5 development boards, with a device that comes with case and power supply. Some efforts would still be needed to make it work though. As Android TV box not interesting at all (better choose Amlogic as you said) and what would be the potential use cases with Linux? Only Fast Ethernet, then software based on Allwinner BSP where they removed/forgot voltage regulation so most probably H5 with a fixed voltage limiting maximum cpufreq and maybe same applies to DRAM too. Hardware-wise, it is not as good as the s905 boxes, yet it cost more. You obviously missed that the sentence above was about enthusiasts trying to get Linux running on this thing (which is a useful warning since with the H5 SoC here software support situation is quite different compared to the H3 predecessor). And you also missed why this device is worth a mention. Since this Allwinner SoC appeared first on a single board computer over a year ago, then a couple other SBC appeared and only now the first device for which the SoC has been designed: a TV box. If you look at the Amlogic competition it’s vice versa: tons of S905X TV boxes but just one single SBC so far. Seems to be an attempt to compete with the S905W SOC. RPi has shown that people don’t need better specs. It’s good enough. RPi 3 has 1GB DDR2, fast ethernet, on-board 802.11n 2,4 GHz wifi, only USB2, HDMI 1.3. Still many are happy. coming into market, why we are going lower in technology and making cheaper and more cheaper boxes with cheap SOCs, why we cant have a powerful box that does everything and can compete with NVidia’s tegra chip. only few boxes come little close to it like zidoo H6 pro (all winner), vorke z3 (rk3399) ,Cloudnetgo CR19, and rk99 (RK3399). but most of them have either buggy firmware or not good support. Nvidia is still supporting 2015 model as of now. right now all these boxes that are coming into market with different names but with exact same hardware. more like same box in a different packing. RPi has never been about the specs. It is to do with market share or vertical markets. Also Nvidia is elite because it is a premium product with premium price, in the arm market space. I have a Advent Tegra note7 tablet which is fast and has good battery life, however it is fast because Nvida used expensive memory. The race to the bottom price in lower TV box market comes about because volume sales are need to recover costs, and audiophiles, videophiles are not a big enough world market to support all the development costs. They are a segment, vertical market of their own. Many higher spec boxes launch but fail to gain traction. It has Sata and Blue-ray support, but still has to compete against lower spec boxes. It’s feature do not get it market traction. Conclusion, mass world markets are happy with cheap box’s for IPTV and streaming. That is where several market reports highlight consumer growth word wide. There is a whole world outside of, just looking at the electronics of a device, for the reasons for its manufacture.